8.42 points at 55 votes (rank 35). 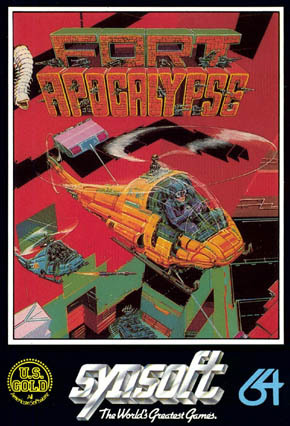 Rombachs C64-Spieleführer 10 1984 "Crème de la Crème"
Fort Apocalypse is an action packed game from the start. At the very beginning you see yourself in the position of a pilot whose helicopter has run out of fuel, indicated by an alarm. Fortunately, your helicopter hovers directly above a fuel platform, where you can fill up for the first time. Right after your fuel tank is full, you have to shoot your way through an aerial mine field, flying over enemy tanks and bomb the barrier to enter the underground fortress. Laser beams and hostile helicopters will also prevent you from rescueing the prisoners from the fortress. At the lowest level you'll have to destroy the reactor of the complex. After that, you'll have to return to the starting point. If you succeed, you have completed the game. When you start again, the enemies are faster and attack more frequently. The energy barriers move faster. The game is for both beginner and advanced players a challenge. 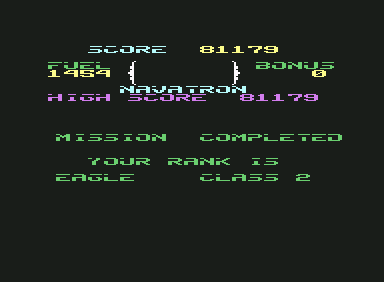 Graphics and sound are good for its time, but of course no comparison at later C64 games. The game has two very large levels, which have good playability. A special feature of Fort Apocalypse is the "Navatron", here you can see the position of your enemies even before they appear on the screen. There are many platforms to land your helicopter, which have a flat, white surface. When you land there, this also will be your new starting point when your helicopter crashes or you get shot. "Moving walls" will move into the opposite direction when you shoot them. There are two ways to reach the reactor, of which only one ALWAYS gives access to the reactor. After the destruction of the reactor, both ways are open. When you approach the reactor from the left, you'll have to navigate your helicopter past the lasers, while the tanks below you try to shoot you - not easy, as there's barely room to avoid the threats. When you approach the reactor from the right, you have to shoot your way through an enormous mine field. There also will be quite some prisoners here you can rescue. When the barrier's open, you can destroy the reactor from this side, too. Rombachs C64-Spieleführer: "Fort Apocalypse is a demanding game; flying skills, shooting accuracy and a confident approach are crucial. The game sometimes is so intense, you forget that it's only a game. Difficulty can be set by changing the gravity. A very good game which requires good control of the joystick." Shakermaker303: "What a game *swarn* Expect everything that will be expected from pilots: you have to shoot and bomb, while you navigate your heli with caution. The controls are excellent, for the Stone Age's anno 1982 there's a lot of depth in the game. A successful mixture of H.E.R.O. and Choplifter I would say. Always fun, not too easy nor too difficult. Simple and iconic, 10 out of 10." 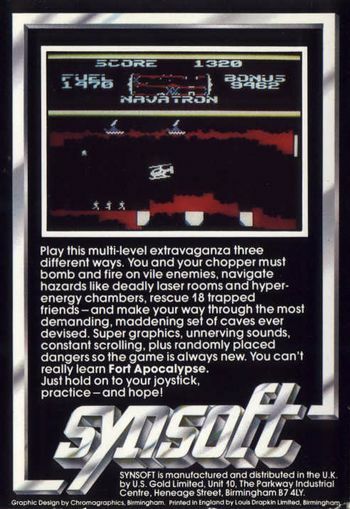 Although this game is available a a ".CRT image", it was never sold as a cartridge. CRT is a "proof of concept hack." This page was last modified on 22 February 2019, at 07:37.